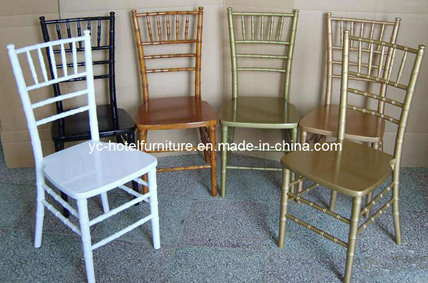 As a professional hotel furniture supplier, We supply chiavari chair. Steel chiavari chair. Stacking chiavari chair. Banquet chiavari chair. 1, Cheap price with high quality. Pass SGS certificate. 2, Strong frame, It can load 250kgs weight. 3, Professional design. It is comfortable for sitting. 4, Grace surface. It wonot hurt person who seat on it. *Desc: Chiavari Chair. Steel Chiavari Chair. Stacking Chiavarl Chair. Aluminum Chiavari Chair. 1)30*30MM square aluminum tube with powder coated finish, the thickness of tube is 3.0MM. 4)We provide lots of fabric and leather in color and design for your choosing, and can be made fireproof according to UK(BS5852)or US(CA117)standard. 5)Using high quality stacking plastic studs and foot plugs. It's very durable. *Packing: Bubble bag packing the backrest and the chair leg first, Then packing by plastic bag to avoid the hit. 8PCS/stack.